Though I had traveled to several countries, when I landed in Kathmandu, Nepal, it was my first trip to a new country alone. I arrived in Kathmandu which is kind of like the wild west. The airport is small and interesting to say the least. Security is nothing compared to the security in the West or India. You bags go through some big scanner, I guess someone is looking at a screen, but maybe not. Then the bag fall into a heap on the floor. It is so funny. A driver was supposed to be picking me up but they were not there. I was annoyed by several drivers, however, one was very persistent. I got my host on the phone and learned the driver’s car had broken down, so he was not coming. I was in the airport parking lot for at least 45 minutes. I shared the cab with two other tourists. I was the second to get dropped off. I stayed in a new neighborhood. The roads were narrow and there were still some fields. It was very nice. On my second day in Kathmandu, I explored the city (you can see other photographs in the post Stories from the Road: A Scene from Durbar Square, Kathmandu, Nepal). Towards the end of the day I went to the Swayambhunath Temple, which is located above the city. From the temple, you can see the entire Kathmandu Valley. It was amazing. You stand there thinking, I can’t believe I am here. In the photograph above, you see the Kathmandu valley. In the foreground you see the top of a tree in the bottom left hand corner. Just above the tree you see prayer flags. 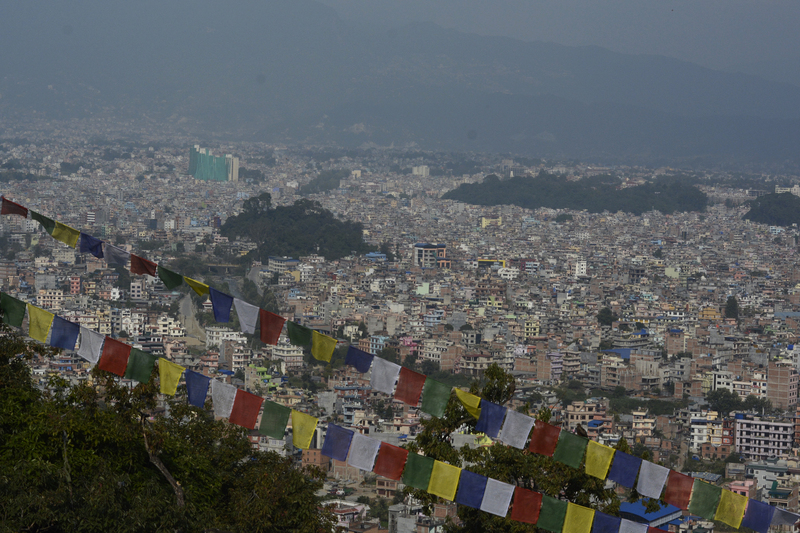 Beyond the prayer flags the buildings of the city stretch into the background. In the top third of the photograph are the foot hills to the Himalayas. It is beautiful. The peace I felt was unmatched by anything I had felt before. There is nothing like navigating a new place all alone. It was an adventure and I would do it again. The people of Nepal are great. It reminded me a little of Colorado. People living in or near mountains have a different way about them from people in other regions. Laid back and adventurous. I can not wait to go back. At the Swayambhunath Temple, you feel on top of the world (and I was close) because you go some place on your own and conquer it. You feel like you can do anything. Now that I am back in Udaipur, I am settling in. I am obviously not on my own here, as I am staying with a friend. However, it is the first time I have ever lived outside the Dallas/Fort Worth area of Texas. It is a new adventure and I hope it turns out as well as my time in Kathmandu.